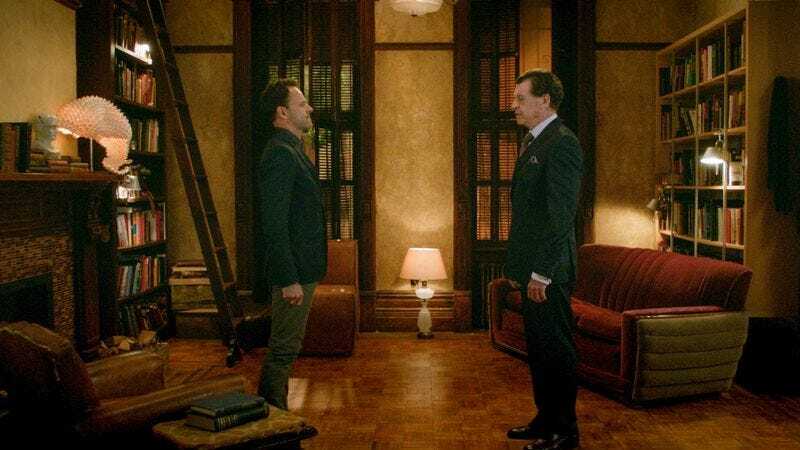 On the lists of Elementary‘s strengths, “the procedurals” almost never appear. The ways this show shines are based in character, tone, and the nature of adaptation; the murders don’t register nearly as much. They usually hover around serviceable, with occasional forays into poignant and interesting, or into CBS procedural standard, which is…not great. It’s not this episode’s only clunker, either. Two issues come up repeatedly in Holmes procedurals, particularly ones set in the modern day: One, criminal investigation has been fairly finely honed since the Victorians began to classify crime and develop forensics; two, the procedural genre has been going gangbusters for over a century, which means audience are very savvy about weekly whodunits. Some of the cases Sherlock and Joan investigate are almost inevitably going to feel like they’re stuff the NYPD should be able to handle, and this is one of them. (They’re not at their best, either: Years working alongside Everyone, and Joan doesn’t know what facial-recognition makeup looks like? Are you sure?) By the time the killer’s asking Gregson, “You think I’m the only guy to ever commit a crime in a ski mask?”, you know exactly what he’s talking about. The cold open, with the killer getting confused himself, almost singlehandedly gave the first act momentum, but paired with the non-event of Morland’s own mystery, it’s not one that will linger. But really, the primary job of this episode’s mystery isn’t to be a mystery: as with most of the better procedurals on this show, it provides subtext to underline a larger point about its characters. Not about doppelgangers; Bob Goodman’s script treats the phenomenon like a sad fact of life that in a world wide enough, you’re not unique, and Joan and Sherlock have been brought face-to-face too often for their similarities to startle them. Instead, it’s Dorian’s life’s work that hits home. Sherlock’s unspoken fear as he grapples with his father this episode is what will happen if Morland stays; it’s that Morland will stay long enough to try to get to know him, something Sherlocok has protected himself against before, all the way to the point of a needle. Here we see the same brittleness Sherlock saves for those he’s afraid of. “Well, as long as you don’t take your wine intravenously, I should be okay,” Sherlock snarks at the party when Morland declines to drink; when Morland’s smile looks genuine, Sherlock’s quietly thrown—afraid of being recognized. All of this is brought home nicely by director Christine Moore, a dab hand at framing the characters in their spaces. The high-rise skylines contrast sharply with a precinct that’s rarely felt so grimy; the truth-telling doppelganger got a greenboard window of sorts, but by the time Gregson’s getting his confession, it’s just a wall of tile with no way out. Morland’s office looks like Versailles, and he takes those stairs like an incumbent king; we know just from looking at it he has no plans to leave town. And by the time Sherlock and Morland are facing off for a little honesty, they’re framed in the front room of the brownstone like warring portraits of Elizabethan nobles. It does exactly what it’s meant to, undermining the reconciliation. This stylized distance forces both them and us to accept that this accord—if it’s even possible—is going to be a painful process. Those windows have almost nothing visually bridging them (they cut clean through the molding), so the men are islands apart. 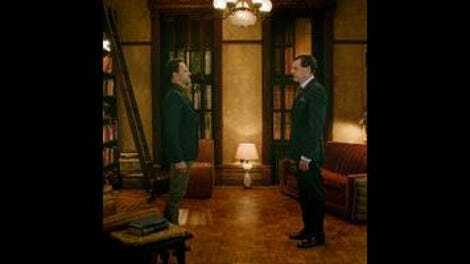 And after Morland goes, Sherlock looks no more comfortable; he’s just off balance, and alone. Maybe just this once: The Clyde Watch comes back with a positive match, as Clyde—or someone that looks so much like Clyde as to be functionally indistinguishable and capable of serving as DNA alibi for Clyde in case of emergency—appears, in order to eat homemade snacks and make us think about the nature of individuality. I hope he gets a chance to share the joys of alibi doppelgangers with Joan when she murders Sherlock for leaving her with that kitchen disaster. This show just presented a case about identical white men turning to their very blandness to help one another escape culpability. If it’s a stab at Holmes Sr., I’m interested. I should also start a running Crucial Scenes They Didn’t Show every week, for potentially amazing character moments “The Captain is a political animal; I’m sure he’s not used to looking gift horses in mouths.” Aidan Quinn is a very good actor who excels at scenes like this! By the time we see him it’s like the end of last season and the beginning of this season never happened; we could have used that bridge here. We were light on Joan this week, and it still feels like Sherlock’s recovery is either being skimmed over or it’s a disaster waiting to happen, but this episode is a continuation of the playfulness from “Evidence Of Things Not Seen”: The wry look he gives her when she suggests Clyde “just appreciates his dinner date going the extra mile,” and her bluntness in the face of his careful interest in her opinions about his father is a nice footing for them to be on right now. I remain ambivalent about Sherlock’s habit of waking Joan up, both because it’s gone from a boundary issue to a running joke without any acceptance from her in between, and because I just want Watson to have a good night’s sleep. And Say Anything-ing her with a frat anthem feels like a new height of letter-of-the-law from Sherlock—though having coffee waiting certainly helps. “Am I crazy, or did I just hear him speaking perfect Spanish?” I mean, based on the season premiere, you heard no such thing, but who knows. I truly love the way that John Noble makes “Joan” sound every inch the overfamiliar power play it is, every time he says it. I am baffled as to why you’d recruit someone with as much presence as Shohreh Agdashloo for a part that’s a glorified cameo, except that it feels like an attempt by the casting department to throw Myles personally off the scent by making sure the most famous guest star was, for once, not the killer. This one’s for you, Myles.